Born in Coromandel, Brazil, Dcastro began to express his talent as a child with drawings, paintings, and sculptures. As a teenager, he showed his work in galleries and cultural spaces in Uberlandia, Brazil. Later he innovated the use of metal on canvas to create his “Metal” series. 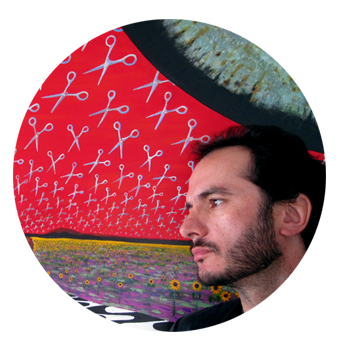 In 2010, he started to create paintings guided by a new artistic philosophy consisting of 7 major elements: Modernity, Contemporaneity, Innocence, Simplicity, Spirituality, Happiness, and Poetry. The result of the seven elements combining with his unique style makes his work not just painting but also dance, music, moving, and poetry on canvases. In the same year, he starts to develop a new art technique which using just natural light he has two different images on the same canvas. His work has given him the opportunity to exhibit his art in various popular television shows as “Californication”, House of Lies, CSI Cyber, Ray Donavan and others, as well as his work appearing in a New York Times article about artist influence in Venice Beach. After exhibiting his work in many Los Angeles art galleries he now has his own space in Venice, CA where he shows his paintings.